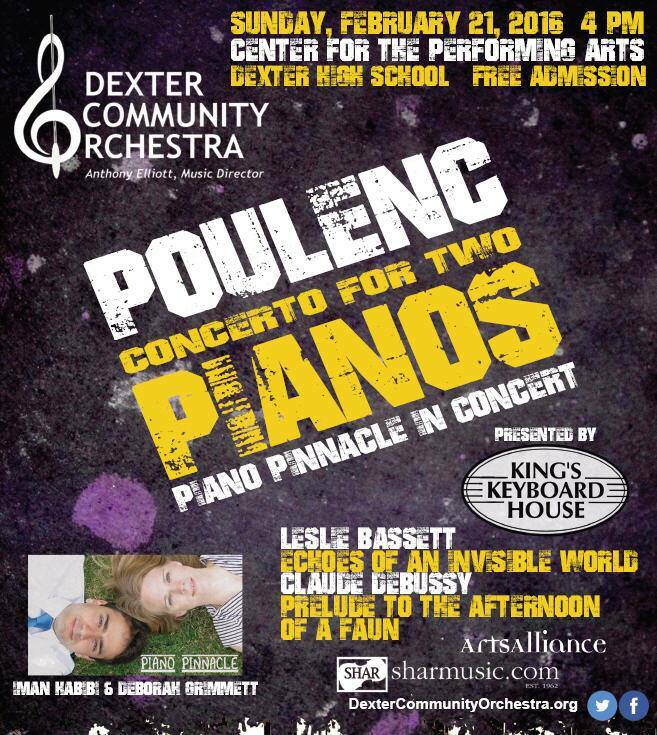 Myself, along with my partner, Iman Habibi, are tremendously excited to be performing Poulenc’s Concerto for Two Pianos and Orchestra in D minor with Dexter Community Orchestra on Sunday, Feb. 21st, 2016 at 4pm at the Dexter Center for the Performing Arts, conducted by the esteemed cellist and maestro, Anthony Elliott, Professor of Cello at the University of Michigan’s School of Music, Theater and Dance. In a letter to the Belgian musicologist, Paul Collaer, Francis Poulenc wrote that he considered this concerto to be “an enormous step forward” and the beginning of his “great period.” He premiered this concerto at ISCM(International Society of Contemporary Music) in Venice with his long-time friend Jacques Février (a video was later made showcasing the two pianists performing the work, with a number of adjustments made to the two piano arrangement). 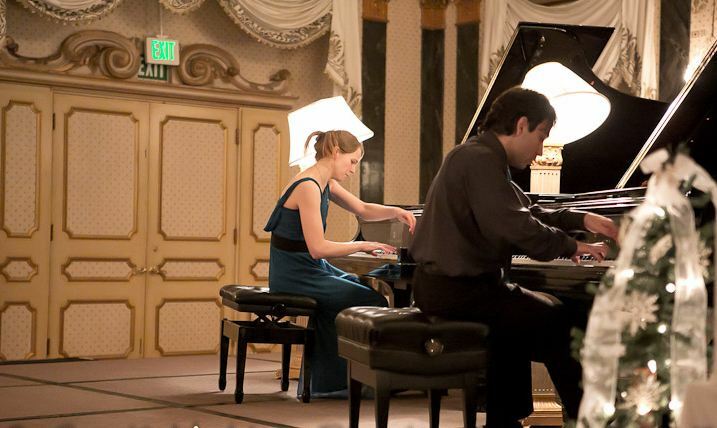 The concerto has become one of the staple works of the piano duo repertoire, and is revered as one the greatest piano duo concerti ever written. Poulenc juxtaposes dissonant chords with neoclassic lyricism, drawing influences from Mozart, Liszt, and Ravel, as well as gamelan music, which Poulenc would have heard at the Exposition Coloniale de Paris in 1931, a year before composing the concerto. The result is a colourful work that can perhaps be considered post-modern, rarely staying in one style for more than a few measures. 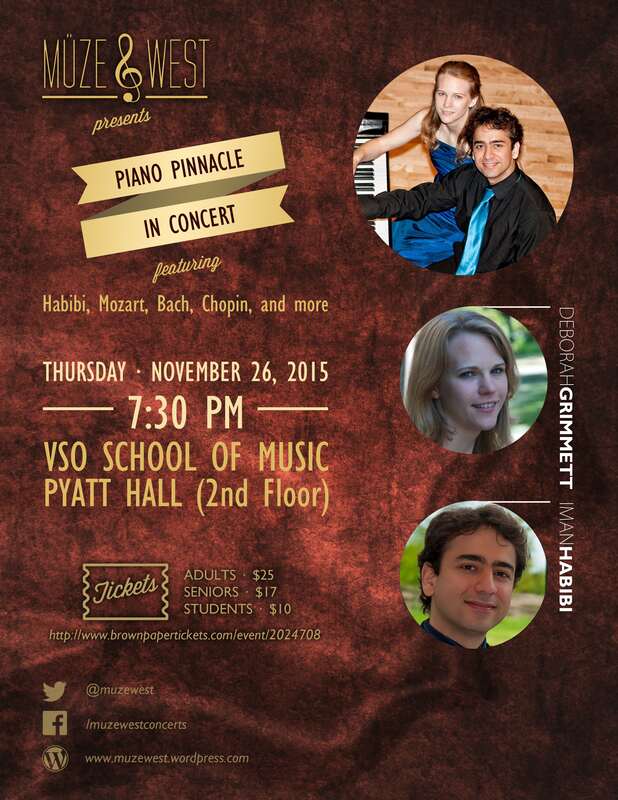 On November 26, 2015, I will be performing a duo piano recital with my ensemble, Piano Pinnacle. The concert is presented by Muzewest Concert Series. We will be presenting a wonderful programme of works by J.S. Bach, Adolphe Blanc, Chopin, Yoshibumi Fujiwara, Albert Ketelbey, Lutoslawski, as well the world premiere of Iman’s new piano duo work! On Tuesday, April 14, 2015, I feel privileged to be giving the world premiere of Iman Habibi‘s latest prelude for solo piano, Prelude a la Gershwin, written as a tribute to George Gershwin. It is always a joy to perform new music, and having the pleasure of introducing the music to the audience for the first time makes it even more thrilling. Stay tuned for a recording of this piece coming soon! In November 2015, I will be giving a recital with my ensemble Piano Pinnacle for Muzewest concert series in Vancouver BC. Stay tuned as we announce the date for this November concert soon! Muzewest is an exciting new voice in the Vancouver concert scene. Apart from having a wonderful line up of concerts each year, they also have a worthy initiative in bringing classical music to children in schools. Each artist gives a concert to school age children, a wonderful way to inspire the next generation of musicians and music appreciators. I am happy to announce that I will join the Vancouver Philharmonic Orchestra (VPO), led by Jin Zhang, for Prokofiev’s great work, Romeo and Juliet Suite. Also on the concert’s programme is a world premiere of Iman Habibi‘s latest orchestral piece, The Promised Hand. Iman is VPO’s composer in residence, and the other half of my ensemble Piano Pinnacle. Brahms’ Requiem is a monumental work of great beauty and power – I look forward to going on this journey with the Vancouver Peace Choir. I am proud to announce that my ensemble Piano Pinnacle won First Prize at the 2014 United States International Duo Piano Competition (USIDPC), held in Colorado. This has been a wonderful way to start 2014, and we are now enjoying a beautiful snowy day in the picturesque town of Colorado Springs. We would like to also congratulate the duos of Bellani e Peroni from Italy and Tang and Jiang from the United States for winning the Second and Third Prizes, respectively. Piano Pinnacle (Deborah Grimmett and Iman Habibi), along with percussionists Martin Fisk and Brian Nesselroad, will premiere seven new works for two pianos and percussion at the Sonic Boom Festival on Saturday, March 29, 2014.